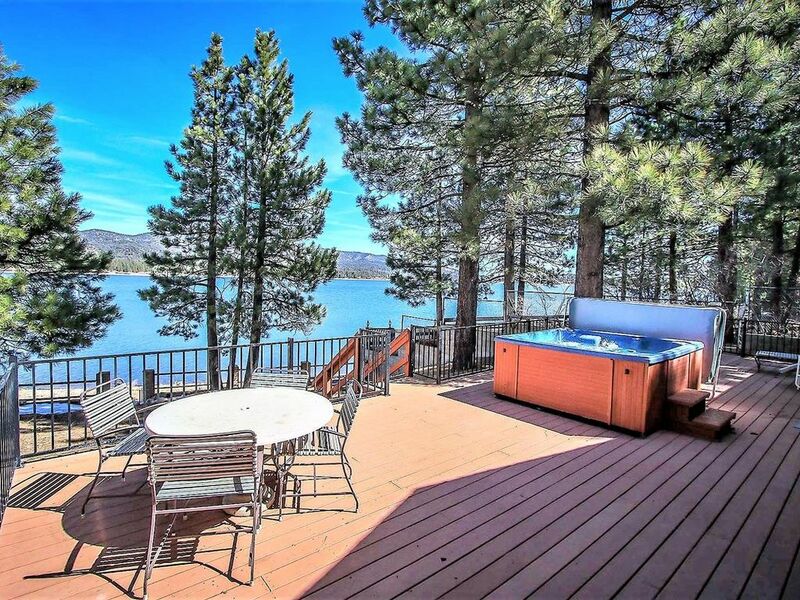 Bear Lake #223 is a lakeside single story family home which boasts a wonderful deck overlooking the shores of Big Bear Lake, and offers a private outdoor spa, charcoal BBQ, and awesome lake access for water activities. The practical kitchen has basic cookware, utensils, and appliances including dishwasher plus breakfast bar seating, while the lake-view dining room offers table seating plus a cute breakfast nook with bench seating. There is also a warm and cozy living room area that features comfy furnishings, mountain decor, a toasty wood burning fireplace, and a huge flat screen TV/DVD player for your entertainment. Bear Lake cabin offers extreme serenity and relaxation, located on a great fishing point, and next to Lagunita Lodge, yet is still only a few minutes by car to local attractions and entertainment, making this the perfect home for your next mountain getaway to Big Bear! There were no frills but had everything we needed except for washer and dryer. We had a great time. The view is worth the money. The cabin sits on the lake which is the reason why you would want to visit Big Bear!!! Because of the lake. It is one of the few rentals that have large three beds (1 King and 2 Queens I believe). Many rentals have the two large beds and then then th third room is full of "kid" beds. Trust me!!! I looked for hours and hours for a room where three couples can spend the night. This is one of them! The disappointing part is that the coffee maker didn't have a pot. So everyone was squeezing coffee into their own individual mugs. It took an hour to make six cups of coffee. I think they need to get another coffee maker because it's hard to just replace the glass pot. The wifi was WEAK! You couldn't upload a picture on Facebook with it so we just all ended up disconnecting and using our 4g. Many of us broke the limit. Which is ok.... Not a big deal. You're not supposed to be on wifi on vacation anywhere, but when you're in a beautiful place taking pics for four days you kinda want the world to know! We called the day before and we were told the cabin was ready. We can arrive earlier around noon. Which was great. We drove from Las Vegas and the rest of the family we flying in from LAX. So we got there around 12:30. We were told then when we tried to check in that it was not ready. So we were confused by the information given to us by the representative the day before. They got us in around 2:30. the rest of the family www annoyed. There were hairs in the main bathrooms toilet and our bed had a long women's hair in the sheets when we unraveled the bed for sleep. The cabin is old so don't except a 5 star hotel. The carped is dingy and very old also. It runs all the way in the bathroom. But I hear this is common in cabins on Big Bear. Remember your paying for the view and the experience. Overall we had fun and we would visit this particular cabin again! First of all, don't let the photos fool you. The house IS right on the lake, fantastic for that. What they don't show you is that there is a HUGE apartment complex right next door, with the parking lot right up against you, and a boat launch. If you are looking for peace and quiet, you won't get it. House isn't much to speak of either. They updated the kitchen, but obviously on a budget. Lots of simple kitchen tools were unavailable if you indeed wanted to cook there. Seemed like nobody had stayed there in a while also. There are much nicer places to stay, and it was overpriced at that. First review I've ever written, so that should tell you enough.